C001 - Corydoras incolicana (i:3, k:8), congeners. C002 - Corydoras parallelus (i:13, k:16), congeners. C003 - Corydoras sp. (C003) (i:4, k:15), congeners. C004 - Corydoras virginiae (i:11, k:43), congeners. 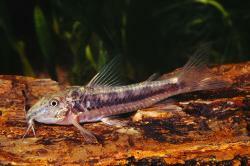 C005 - Corydoras pantanalensis (i:13, k:29), congeners. C006 - Corydoras sp. (C006) (i:0, k:0), congeners. C007 - Corydoras sp. (C007) (i:1, k:13), congeners. C008 - Corydoras sp. (C008) (i:0, k:1), congeners. C009 - Corydoras lamberti (i:4, k:3), congeners. C009 - Corydoras sp. (C009) (i:0, k:0), congeners. C010 - Corydoras sp. (C010) (i:1, k:0), congeners. C011 - Corydoras mamore (i:1, k:0), congeners. C012 - Corydoras cruziensis (i:4, k:4), congeners. C013 - Corydoras sp. (C013) (i:0, k:0), congeners. C014 - Corydoras sp. (C014) (i:0, k:0), congeners. C015 - Scleromystax lacerdai (i:9, k:8), congeners. C016 - Corydoras sp. (C016) (i:2, k:5), congeners. C017 - Corydoras stenocephalus (i:7, k:8), congeners. C018 - Corydoras sp. (C018) (i:3, k:4), congeners. C019 - Corydoras sp. (C019) (i:1, k:3), congeners.